The week before finals my first semester of freshman year, the dining hall right next to my dorm made a major and marvelous change: every table was covered with gigantic sheets of paper and adorned with Crayola crayons. It was great because most (if not all) of us hadn’t colored at the table since we were ordering off the kids menu, and for a few minutes, we could take our minds off finals and scribble next to our plates. You see, Bolton was on to something – finals, obviously, is the most stressful time of the semester because it kills students’ brains. And coloring is brainless – that’s part of why it’s so empowering. Even though some people say that coloring books kill creativity, they’re great for therapy because you don’t have to make any decisions grander that what color crayon you’re going to use next. You don’t even have to follow the rules. Your parents didn’t care when you didn’t color inside the lines, did they? No, because they wanted you to be happy, so they hung your masterpieces on the fridge or even framed them regardless of whether you filled the lines in neatly or scribbled all over the page. And that made you really happy. Coloring is therapeutic for me because I can feel myself pushing my problems out through the colored pencils. For 15 minutes, I can cast whatever I’m worrying about (so, you know, everything) away and just focus on getting a job done, and nobody is going to assess my performance because well, criticizing how somebody filled out a coloring book is kind of ridiculous. Maybe you’re super anti-coloring book and hating everything I just typed, but you know, coloring works for me. It really does. 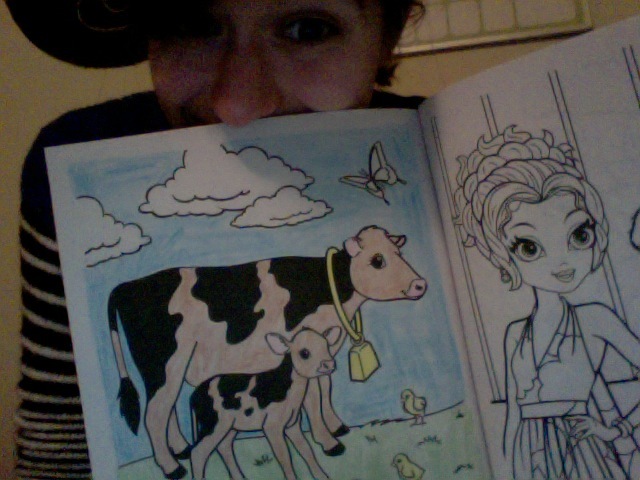 So, what did I think when I came across a Lisa Frank coloring book that’s selling for a dollar last night? LISA FRANK. MY CHILDHOOD AND THE DOLPHIN STATIONERY I LOVED. I can’t believe Urban Outfitters isn’t selling this same book for $15 yet. Okay, but really, this is the only coloring book in the whole dollar section, and I think I’m supposed to take it home with me and use it. I didn’t even flip through it until after I got home, and do you know what I found? Leopards. Puppies on a giant heart in a checkerboard dimension. Angel kittens in angel kitten heaven. And then I saw it: a cow and her baby. This was the first page I was going to color, and it was going to make me feel better. And you know what? It actually did.